You can become better prepared for flooding by knowing your risks, having a plan, and putting together an emergency kit. Learn more here about the current status in our watersheds, our real-time gauging network, and our recommended flood precautions. Explore the current conditions in our watershed. TRCA’s flood monitoring gauge network spans the GTA, continually monitoring in-stream water levels at TRCA dams and river stations. Real time stream flow, water level, and precipitation information is available HERE. While the website is designed as a portal for Flood Duty Officers and our municipal partners, limited access to data is available to the general public. Be flood ready by knowing your risks. Speak to your insurance provider to find out what is and isn’t covered by your policy. Check out the Government of Canada’s Flood Ready steps: Flood Ready First Steps. You should also create a household emergency plan ahead of time. This plan should detail the actions you and your family need to take before, during and after a flood emergency is declared. Have a 72-hour emergency kit prepared for each member of your family. The kits should be easily accessible and easy to carry with you in case you have to evacuate your home. Use TRCA’s handy guide to create your 72-hour preparedness kit. There are also some steps you can take before a flood to reduce the likelihood of damage to your home. Protect your property with flood ready fixes provided by the Government of Canada. Also check with your local Municipality for by-laws and incentive programs for protecting your property against the risks of flooding. Consider installing a sump pump and zero reverse flow valves in basement floor drains. If you already have these devices, follow the manufacturer’s instructions for cleaning to ensure that they are functioning properly. Clean your eavestroughs. When they are blocked, rain can pour over the edges and could spill into your basement. Do not store your important documents or valuables in the basement. Keep them at a higher level, protected from flood damage. In a rural farm setting, sheltering livestock may be the wrong thing to do. Leaving animals unsheltered is preferable because flood waters that inundate a barn could trap animals inside, causing them to drown. Stay away from fast flowing streams, rivers, and areas known to flood. In some cases, homes may be protected with sandbags or polyethylene barriers. This approach requires specific instructions from your local emergency officials. BE CAUTIOUS AROUND FLOODED AREAS. Stay away from rivers and streams; frozen banks and/or soft banks along the rivers can be slippery. It is not recommended to walk or drive on a flooded area or road. If you are on foot, fast water could sweep you away. If you are in a car, do not drive through flood waters or underpasses. The water may be deeper than it looks and your car could get stuck or swept away by fast water. An average car cannot pass through water deeper than 0.3m (1ft). If you are caught in fast-rising waters and your car stalls, leave it and save yourself and your passengers by moving to higher ground. Do not swim outdoors during a rainfall event. Do not attempt to rescue friends or pets from the river if they fall in, as you may also be overcome by the force of the river. Call 911 for help immediately. Tune in to your radio for updates on affected areas, safe access roads, where to go and what to do if the local emergency team asks you to leave your home. Be prepared for disruptions to essential services and transportation. Evacuate your home when you are advised to do so by local emergency authorities. Ignoring such a warning could jeopardize the safety of your family or those who might eventually have to come to your rescue. Restore your home to good order as soon as possible to protect your health and prevent further damage to the house and its contents. You can learn more at getprepared.gc.ca. In the event of basement flooding please contact your local municipality. 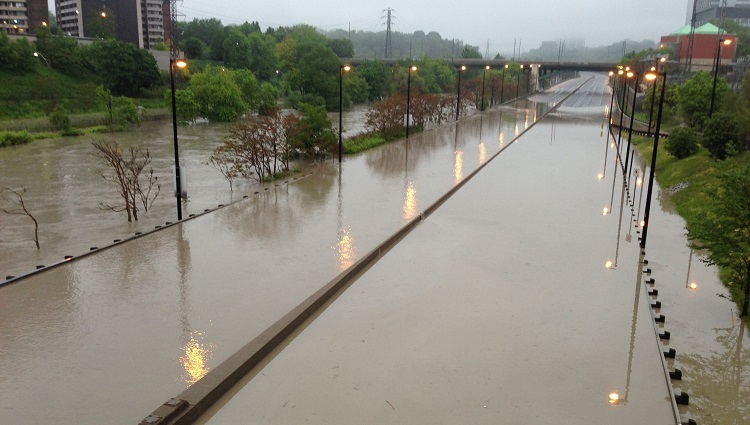 The responsibility for flood contingency planning is shared by municipalities, conservation authorities and the Ontario Ministry of Natural Resources and Forestry (MNRF). As with all emergencies, municipalities have the primary responsibility for the welfare of residents during flood events and may call upon the Province for support if required. 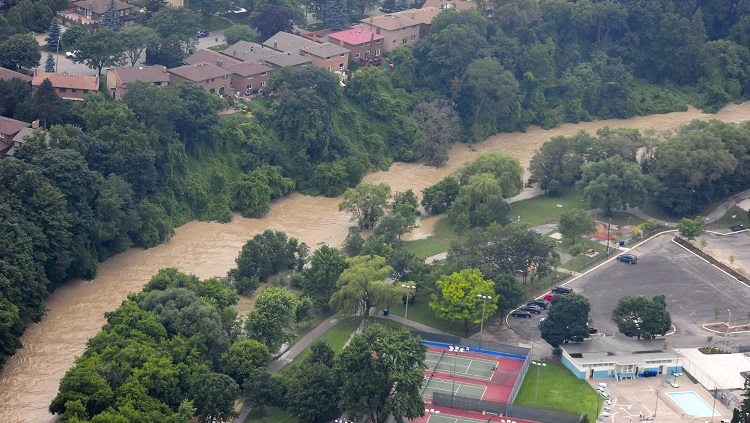 MNRF and conservation authorities are primarily responsible for operating a Flood Forecasting and Warning system which involves issuing messages and providing advice to municipalities.